Skopje (Republic of North Macedonia) (AFP) - Greece's prime minister was greeted with hugs and selfies on Tuesday during his landmark visit to newly renamed North Macedonia, where the neighbours celebrated a new start after resolving their decades-long identity row. The one-day trip came a little more than a month after Alexis Tsipras and counterpart Zoran Zaev finalised a deal that added "North" to Macedonia's name to distinguish it from a bordering province in Greece. It was the first official visit by a Greek prime minister since the former Yugoslav republic of Macedonia declared independence in 1991, kicking off the name dispute that roiled diplomatic ties amid dogged wrestling over the name Macedonia and its cultural heritage. 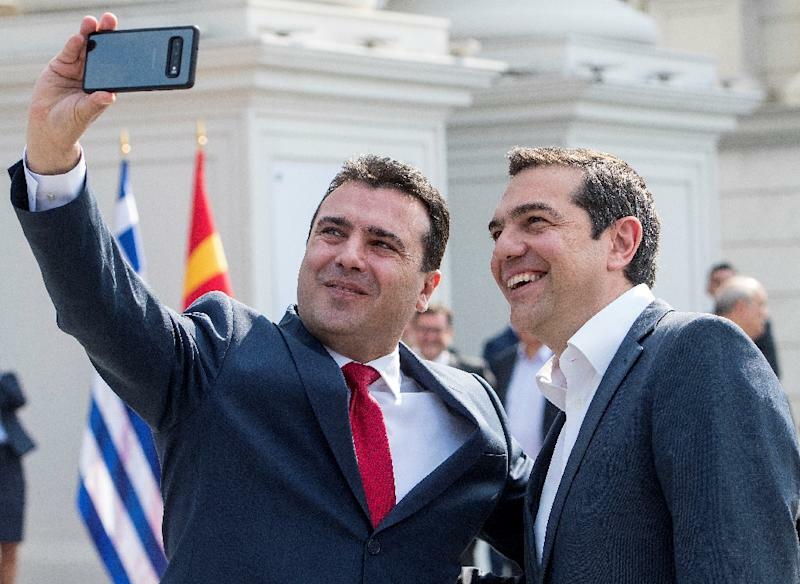 "Today our Republic for the first time in its history is a hosting an official visit of a Greek Prime Minister," Zaev noted during a joint press conference, after he welcomed Tsipras with a warm embrace outside the government building and raised his mobile phone for a picture. With the name issue behind them, the two countries are now exploring the potential of stronger economic ties, with both leaders to attend a business forum later in the day. Tsipras, who brought ten ministers and dozens of business leaders with him, said he believed critics of the deal would be swayed once new financial, infrastructure and tourism links kick in. "Gradually everyone will start to understand, both the Greek people and the citizens of North Macedonia, the damage that has been done over the past years when we were unable to sit together and try to solve our disputes," he said. After the initial name accord was inked in June 2018, congratulations poured in from around the globe for the two young premiers, who fought risky domestic political battles to push the deal through, enraging nationalists on both sides of the border. Even before the deal was finalised, they were nominated for the Nobel Peace Prize by 2015 winner Wided Bouchamaoui of Tunisia. But there is still opposition to the deal among nationalist groups in both countries. In Greece, some are angry that the deal allows its northern neighbour to continue referring to its people and language as Macedonian. Disgruntlement is also palpable in Skopje among those who feel the name-change is an embarrassing concession and that the end-goal -- entry into the EU -- may never materialise. Yet the timeline for the latter could slide, with appetite for enlargement shrinking considerably among several members of the bloc, particularly France. The two-term president is to be replaced following elections later this month.